Thankfully, when I hit college I was able to embrace my geeky-girl self and feasted on graphic novels (for college credit!! ), SciFi movies and long discussions questioning why anyone would make Highlander 2. For some reason, it didn’t matter that other people didn’t think it was cool anymore. And back in the 90s, geek was not chic. ComiCon was still about comic books, and not a pop-culture mecca. But, hey, I also wore flannel. Youthful transgressions, right? Over adulthood I’ve developed a love of all things science-fantastic. My husband and I see most of the big geek fest movies (we even went to see the Star Trek: TNG movies…in the theater). We’re unrepentant (if newly converted) Browncoats. We watch Torchwood and plan to stop by Cardiff when we visit the UK in a few years. Our top bucket list item? San Diego ComiCon — oh the splendor and the wonder! Now I’m raising a pair of geeks. My nine-year-old daughter–who’s really quite girly–was given her choice of musicals to watch on Girls’ Night. She picked Captain America. That was a proud parenting moment. My son watches shows like Mythbusters, Star Wars: The Clone Wars, and Iron Man. As a family we enjoy staying in to play Rock Band together more than going out. And I love it! But I still wonder if my kids’ geek-proud attitude will carry into high school, or if they’ll put it in a box like I did. I hope not, but if they do, I’ll understand…and try not to embarrass them (too much) when I tell their friends I’m planning on hitting the midnight showing of Avengers 2. How about you? Any guilty geeky pleasures you like to indulge in? Or were you like me, and had to hide a secret identity during high school (or at work, for that matter!)? 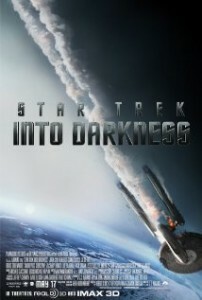 Now if you’ll excuse me, I’m devising a plan that will enable me to see Star Trek: Into Darkness sometime this weekend. Priorities, people! Priorities. This entry was posted in Blog on May 17, 2013 by Kendra. Kendra, I love it! I felt the same as you during high school – hiding books behind my textbooks – not from my teachers, but from my classmates! Oh well. It’s amazing how times have changed, and how mainstream fantasy and sci-fi have become. I still get a little bit of that “oh-no-someone-might-overhear-me” embarrassment when I talk to someone in public about fantasy or sci-fi stuff. I guess someday I’ll get over it!